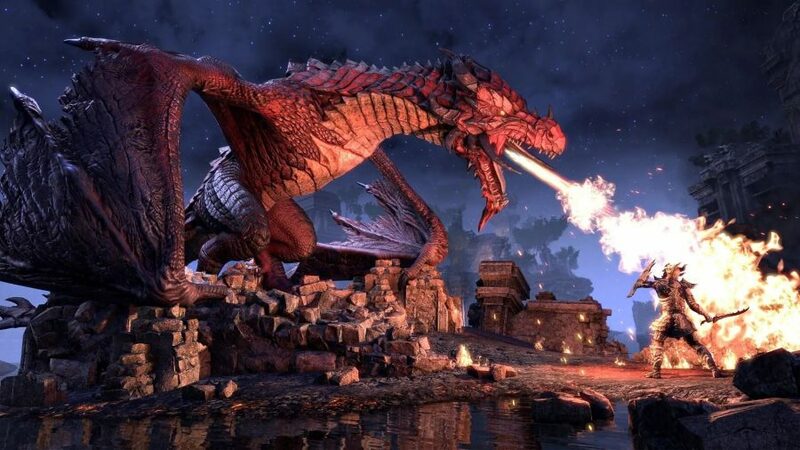 ESO director Matt Firor says that in Elsweyr "you're not Dovahkiin, which means dragons are really, really, really dangerous"
In The Elder Scrolls V: Skyrim, you played as the legendary Dovahkiin, “a warrior with the body of a mortal and soul of a dragon.” In that game, it was your destiny to rid the land of the evil dragon Alduin, taking down many of his reptilian pals in the process. In The Elder Scrolls Online’s latest expansion, Elsweyr, there are plenty of monsters you’ll need to deal with, but you won’t have any of the Dragonborn’s powers to help you. According to ESO director Matt Firor, that makes the beasts you come across in Elsweyr far more of a threat than those you might have encountered in Tamriel’s frozen north. Thankfully, you’ll have some new tools at your disposal to help out. When we spoke to Matt Firor in an interview earlier this month, he talked through the expansion’s new features. As well as bringing dragons to The Elder Scrolls Online for the first time, Elsweyr reimagines a location not seen since 1994’s Arena, the new Necromancer class, and a whole lot of cat-people. 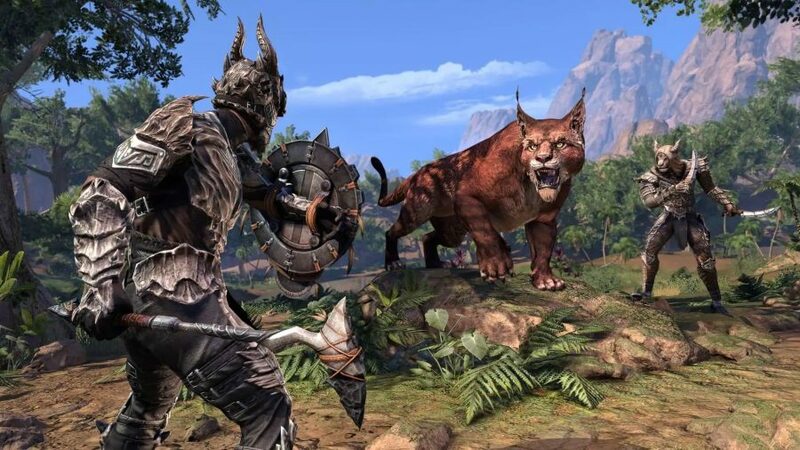 PCGN: What drew you to Elsweyr as the setting for the new expansion? Matt Firor: There are very few parts of Tamriel that haven’t been explored and an Elder Scrolls game. Last year, we did one of the last ones with Murkmire and Black Marsh and now Elsweyr was kind of the last one that was completely unknown. And by completely unknown, I mean, people hadn’t been there since 1994, with Elder Scrolls 1, so we picked it because we wanted to go to a place that was not very civilized, where there wasn’t a lot of lore. We have dragons – everyone knows that this timeline, there are not a lot of dragons in Tamriel, but they’re not gone. So we want to pick a place where if they are more dragons, there wouldn’t be a lot written about them. Because it’s a place where there’s not a lot of lore generated from this. We talked about this a lot internally, with Morrowind. Everybody knew what they were going to see the minute they stepped off the boat in our version of Morrowind, because even though it was 700 years before, it’s the same cities, same races, same enemies. We could tell different stories, but we did [Morrowind] for nostalgia. With [2018 expansion] Summerset, no one had been to Summerset since Arena, either, but the Altmer who lived there have tons of lore about them. So people knew what to expect, at least from the attitudes of the Altmer, and kind of the stories we would tell they didn’t really know what the geography would be like. So we got to do that. Nobody knows anything about Elsweyr. There’s very little lore about the Khajiit. And the lore that exists is not in-depth about their society, or their learning, or the way that they do things. It’s much more about how the moons affect, the different types of Khajiit. There are 28 subraces, everybody knows about that. But nobody knows ‘what is a Khajiiti mages guild? How do they fight each other? What weapons do they use?’ There’s not a lot of lore about that. And so it was much more of a blank slate for us – geographically in Arena we know there are cities like Rimmen and there’s some bigger cities in their maps, but a lot of blank spaces. So we got to do a lot of fun stuff. Was the diversity of Elsweyr as a setting difficult to deal with? We ended up hitting on just using what lore we had; the fact that parts of it were described as kind of jungley; some were described like North Africa would be like; some were described like the American desert around the Grand Canyon. And so we took those three references from existing lore and kind of made a biome work out of it where towards the water it’s much more jungle because it’s a little wetter. And then there’s this big canyon in the middle, and then there’s a much drier Savannah to see. So it we made it work in a way that works for the game and the continent of Tamriel because it has to make sense. You can walk up to the borders of Elsweyr in other provinces right now, and we will need to make sure that it’s it doesn’t clash. How easy has it been to bring Dragons to this new location? This isn’t a dragon place like Skyrim was, where there were temples and a whole culture built up. An unknown number of dragons were trapped in the Halls of Colossus – this giant dungeon which was in Arena – for an unknown amount of time. 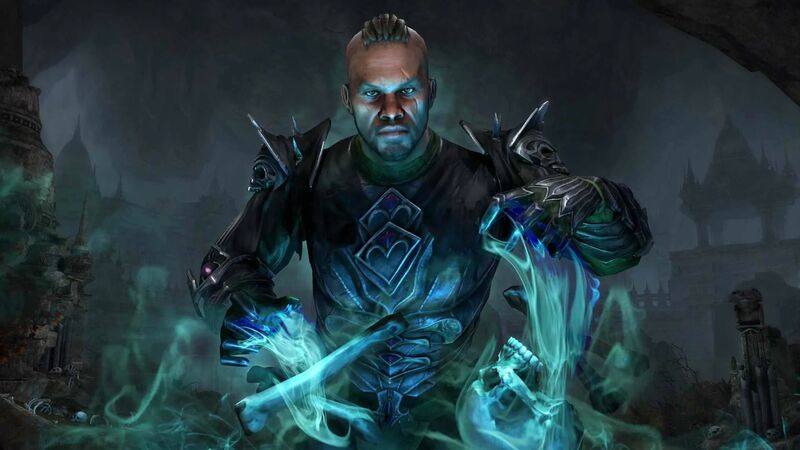 Unwittingly Abnur Tharn has unleashed them on Elsweyr, and needs your help to fix the situation. But it’s a finite number. It’s not like a full-on invasion, like Skyrim. And the Khajiiti aren’t really equipped to handle them, there’s no culture of dragons there. But once you start playing through the story, you’ll start to learn things about the Khajiit and dragon history, which go to very interesting places. Is Elsweyr’s narrative going to be recognisable for Skyrim fans, or are these two very separate stories? They’re separate stories, because the story of Skyrim is not about dragons. It’s about Dovahkiin. And in this game, you’re not Dovahkiin. So you are not Dragon Born. There was a civil war going on in Skyrim when they showed up, much like there is in Elsweyr, but the dragons don’t care about that. In Skyrim, obviously, they were bent on the end of the world, and in Elsweyr they are bent on revenge. So different motives, but they both go to interesting places. What’s it been like trying to bring dragons to life within an MMO setting, rather than within the more traditional RPG setting? In Skyrim you learn how to speak dragon, you learned how to use their own weapons against them. Here you’re not Dovahkiin, which means that dragons are really, really, really dangerous. You’re never going to kill one by yourself. It’s not not typical for a player to take one on, it’s a group mechanic. As an example, we took the Dark Anchors that we have in the older base game, which was group content, where in five or six locations in a zone Anchors come out of the sky and demons erupt from them. We took the same idea for this for dragon attacks, but they move around. So you’ll open the map, and you actually see a dragon on the map icon flying around. And eventually if you follow it, it’ll land and then you can start fighting it and then it’ll take off and you fight it again. But if it’s just one of you, you will not be successful. The fact that you can’t fight these things solo makes dragons inherently a multiplayer system, which which works well towards what we like to do in ESO, which is incentive players to play together without forcing them to. If you see a dragon, everyone is going to look up and they’re going to run towards it and then you fight together. And suddenly you’re in a group because you’re fighting something together. What’s it like bringing an entire year of narrative together? It’s interesting because we were used to telling stories – telling a dungeon story, telling a chapter. If you think of any one word that you use to describe ESO it’s storytelling, because I think it’s what we do best overall. But this gave us the chance to do some recurring character motifs, which we do a lot from the base game. Here, we get to actually interweave them throughout the year with four different updates. So we can introduce a character in [previous update] Wrathstone, then he’s your bridge to Elsweyr. And then something happens and another character leads you to the next thing. So it’s a bunch of bridging stories, which is cool. You could play them all independently and still have fun, but if you do the whole thing you wonder how they all come together. What can you tell us about Necromancers? The Necromancer is our second new class to the game since we launched. You get three new skill lines – a damage line, defense line and healing line. That’s pretty standard, but where they differ is that necromancy is illegal in Tamriel, and so we decided to tie in our justice system. When you pick pocket or steal something in town, if you’re hidden you can get away with it. But if someone sees you then you get a bounty and then the guards come and beat the hell out of you. Necromancy uses that same system. If you’re in a town and you summon a skeleton or cast a healing spell, you’re going to get a bounty because it is illegal. So it adds that sense of character to the game. It sounds like it’s a very game-y, system-y thing but it actually makes you think. How many times are you in town and you want to teleport somewhere and you’re like ‘Oh, I should heal myself first’? So you hit your heal spell and then suddenly guards are attacking you because you’re summoning the spirits of the dead. What kind of impact you think the Necromancer is going to have on the game going forward? If the impact of the announcement is an indicator it’s going to be amazing. We got a lot of players super interested already just from the when we did the big announcement on Twitch. We got a lot of players come back to the game immediately to prepare. We’ve seen a lot of engagement just from making the announcement, because people love cat people and people love dragons and people love necromancers, and now you get all three in the same update. That’s pretty cool.